After internet poker was banned in the United States, he moved to Montreal to continue his career, and in the process, also continued training a machine to play poker. He realized he'd become a better player by teaching the machine how to play but hadn’t yet achieved his desired goals for the actual machine itself. “It dawned on me that I didn't really know what I was doing or how to make it better,” he said. Additionally and simultaneously, Sherman-Ash began to “grow weary of the inevitable swings poker brings,” as he put it, and a relative suggested he look into technical bootcamps based on his interest in, and natural knack for, machine learning and coding. He attended Metis in New York City before landing his current role as a Data Scientist at FanDuel, the second largest daily fantasy sports company in that industry. The company’s built-in culture gives him license to roam the world of daily fantasy sports data, where he wields his analytical tools to derive insights. He isn’t confined to working with a certain type of data or modeling and regularly applies both unsupervised and supervised learning techniques, recommendations, and time-series modeling. He works within a relatively small data science team that’s using every aspect of the discipline they know, all the while trying to learn more as they go. “We're lucky to have an excellent data engineering team that maintains our database and ETL pipelines, so we can focus on forecasts, modeling, and analysis,” he said. Though like any job, it’s not without challenges. Time is a big one, as well as the related challenge of determining when to use which model. “We stand on the shoulders of giants," said Sherman-Ash. "All of these complex algorithms are already written, optimized, and open-source, but because the tools have become so powerful and easy to use, understanding when to use which model can be the hardest part." Sherman-Ash largely credits his final project at Metis with helping him land his first data science gig. In it, he predicted fantasy sports performances of NBA players, enabling users to create custom, optimized daily fantasy sports lineups – and it could not have been more applicable to his current employer. 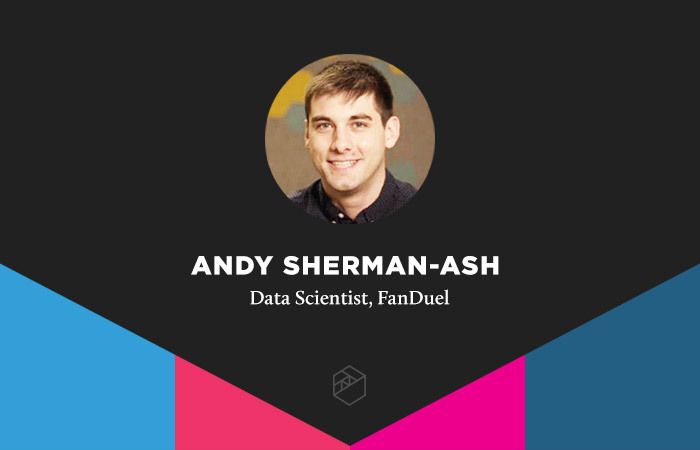 His portfolio of projects, along with the skills learned throughout the bootcamp, helped fill his employment gap, and led him to FanDuel, where he's happily blending many interests and talents into one role.